Western Digital claims to have created the first truly all-in-one back-up system with the release of the MyPassport Essential 500GB. Instead of buying an external hard disk and going to the trouble of setting up a third-party application such as Acronis True Image, you simply plug in the My Passport Essential drive, run the software once, and forget all about it until you need it. The drive itself is incredibly small. It's just a centimetre and a half thick and takes up less space on your desk than a real-life passport at 8.3cm wide and 11cm tall. There's only one socket – a mini-USB port that delivers data and power, making this an incredibly tidy way of increasing the amount of storage you have access to. If you like the design rather than the capacity of the My Passport, it's also available as a 640GB disk, with smaller versions available too. When you plug it in, My Passport presents itself as two devices. 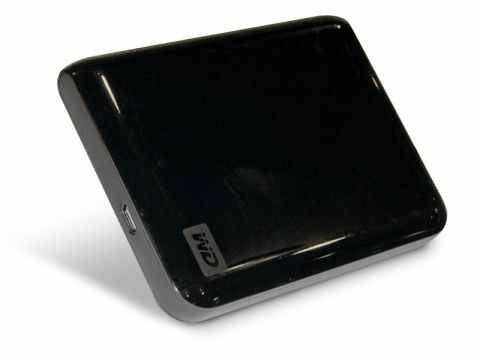 The first is a standard external hard disk with 465GB of space. The second is as a 450MB CD drive containing the installer for Western Digital's SmartWare software. This dual configuration usefully prevents you from erasing the bundled back-up software by mistake. The software offers an excellent range of tools. For instance, you can set up how soon you want the drive to power down if left alone. You can also run a handy SMART (Self- Monitoring, Analysis and Reporting Technology) test on the drive, which should alert you to impending failure. There are options to wipe the disk or encrypt it with a password, too – the latter being useful on a disk that's perfectly sized for popping into a bag and taking on the road. SmartWare uses 256-bit encryption, which is unbreakable (practically speaking). The headline act, though, is SmartWare's back-up facility. This allows you to search storage devices on your PC (including external drives) and pick the kinds of files you want to save from obvious categories such as documents, mail, movies, music and pictures. The principle is excellent – once you've run a backup for the first time you don't need to worry about scheduling further backups. SmartWare backs up continuously, constantly adding and altering files to reflect the current state of your system. You can also set it up so it only backs up files while your PC is idle, avoiding bottlenecks and slowdowns if you're doing disk intensive work. The backups are saved as images to the My Passport drive. That means that you can't simply browse your backups on a PC that doesn't have SmartWare installed, but it does simplify retrieving your backup after a crash. Clever touches abound. Being able to click on a genre of data – pictures, say – is far easier than manually navigating to a folder on a specific hard disk. Likewise, setting up a regular back-up regime is more complicated than SmartWare's simple solution of backing up continuously. While we were using the drive we didn't notice any dramatic decrease in system performance. The hardware is tempting as well. The hard disk itself takes up virtually no space on a desk and the fact that it uses only one cable is excellent news. This makes it a practical device for those who find themselves working on the move.